Everyone at some point in their life pinches or smashes their fingertip under or between something. It's just a part of life (ouch)!! If it were not for the fingernail, the injuries would probably heal within a few days like a common bruise and have no lasting effect or pain. However, because the fingertips are highly vascular, minor trauma, such as a crushing injury or a blow to the fingertip will cause them to easily bleed underneath the fingernail. Your skin, and the anatomy of the fingernail, naturally seals that area below the nail and does not allow the blood to drain. 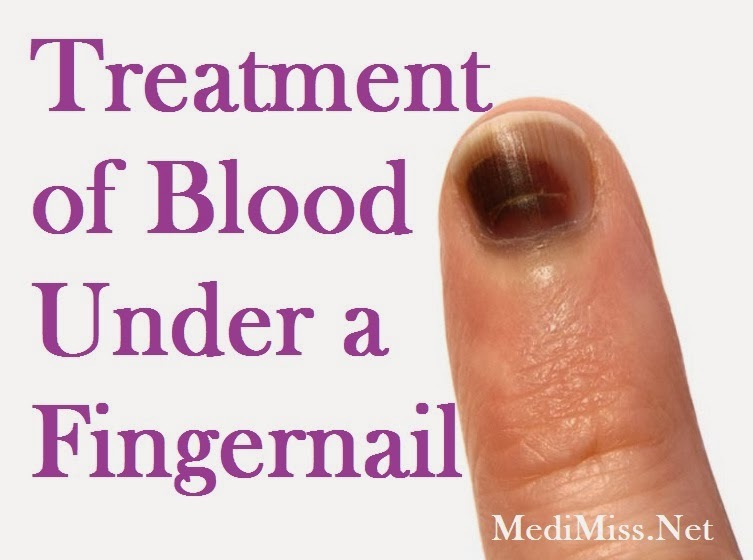 The blood therefore pools in the nail bed, causing an increase in pressure and intense throbbing pain. This is how the fingernail becomes darkened, and you can often literally feel throbbing pain to your injury, with each heartbeat. Treatment and Expectations: Immediate treatment includes ice and elevation of the limb to minimize the swelling of the injury. Sounds easy you say? Well read on! The next part is not for the faint at heart. If the pool of blood under the nail is painful and you can feel a throbbing sensation (your pulse), then relief can only be achieved by actually releasing the pressure. 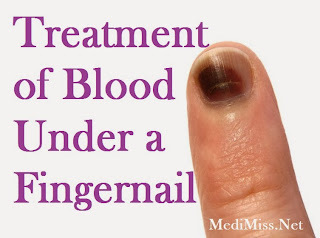 This can be done by creating a hole in the top of the fingernail itself, and allowing the blood to drain. Now this may sound like the last thing you want to do to an already painful finger, but if you get in the car and drive to an Urgent Care center, this is exactly what they would do. The following section describes two basic ways to painlessly achieve this, one by drilling a hole, and one by burning a hole. Neither way is any more painful than the other, and both are very easy to do. One way to do it: The hole can be made with a jeweler's drill (a really small drill bit that you can twist by hand), or an 18 gauge syringe type needle. Clean the top of the nail off with alcohol and begin drilling the hole directly over the largest and darkest part of the blood pool. Use a quick twisting motion of the needle or drill with very little pressure. You won't feel any additional pain because the nail has no nerves in it. When you get through the nail, blood will spurt out of the hole, often with surprising force, and relief will be instantaneous. You can also try to gently squeeze out any remaining blood from the hole. The fastest and best way to do it: The other method involves melting a hole right through the nail. Although it sounds horrifying, in my experience, it is easier, faster, less traumatic and more sterile since it cauterizes and kills bacteria with the heat. To begin, first straighten a small paperclip. Then holding it with a pair of glove or pliers, heat the paperclip in a flame until it gets red hot, and then poke a hole in the nail. You really should not have to push the paperclip, as it will melt through by itself. Apply just a little pressure, right over the darkest spot, and continue until you feel a little pop, or blood is released. You want to do this procedure quickly enough so that you won't have to reheat the paperclip again to finish the job. When you get through the nail, blood will spurt out of the hole, often with surprising force, and relief will be instantaneous. You can also try to gently squeeze out any remaining blood from the hole. Whichever method you choose, you don't want to go deeper than about 1/16 in. (2mm) below the nail. (Don't stress about this, just estimate it with your good judgment and get it over with!) After your done, soak in some Hydrogen Peroxide solution, repeat the soaks three times a day. This is to prevent a clot from forming and causing pressure to build up again. You might have to squeeze once or twice again, but usually, the first time does it. -Signs and symptoms of infection. -You lose any movement or range of motion in the body part as a result of the trauma. -The injury appears to be worse than a simple bloody fingernail. -When in doubt.